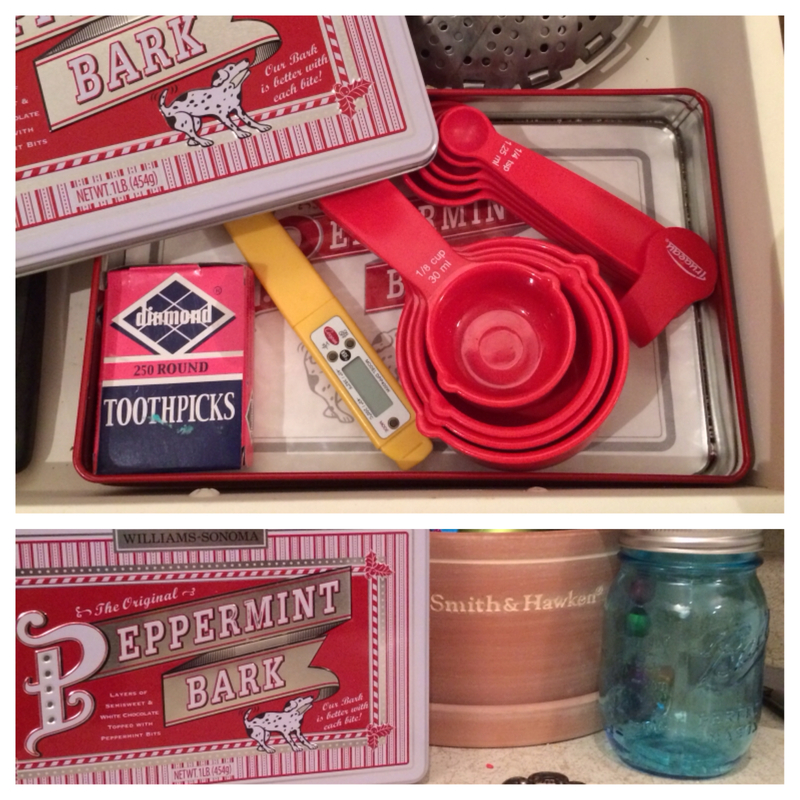 Consider this The Broke Girl’s Guide to Organizing – 2014! It’s a fresh new year, and many of us are looking for a fresh new start. We want to improve our minds, our bodies and that big “O”. I’m talking about Organization of course! Organizing your home gives you a sense of control and order, and it impresses your mom when she comes to visit. Want to get organized for 2014 AND save money at the same time? Me too! So, I compiled this list of 10 FREE Organization Hacks to get you started on your resolutions! Recycle your emptied out sauce jars in place of buying a new Mason. 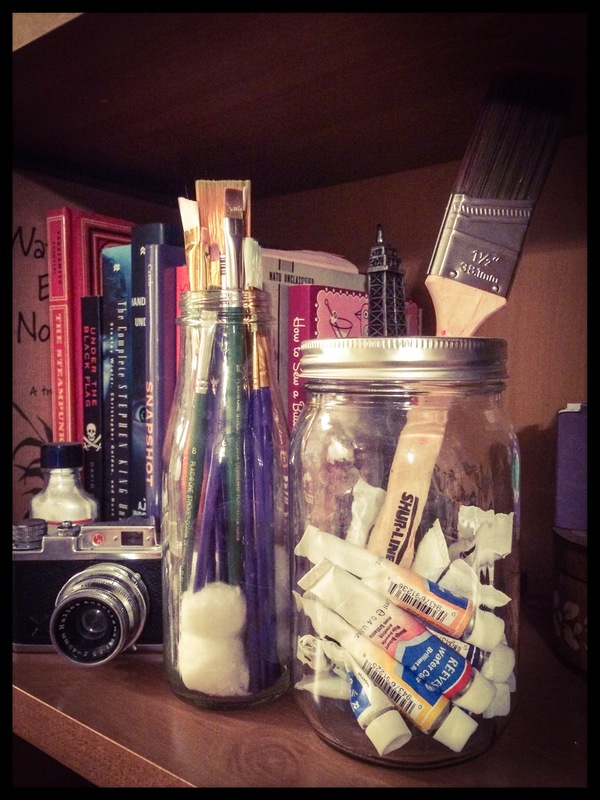 Anything you can use a Mason jar for, you can use an upcycled Sauce jar for. Organize things like pens, paint brushes, and cotton balls. Your stuff will be in one confined place, and it’ll look good doing it. 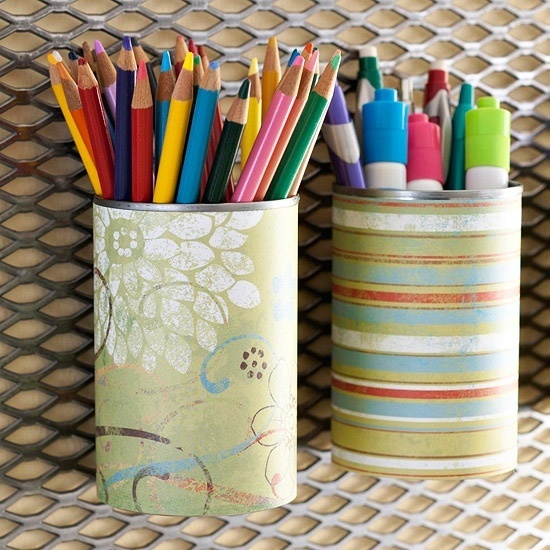 You can repurpose the tin cans your soup or other goods come in to organize your things as well. They too can add a touch of vintage or upcycled charm to your home. Go with a bare can, or doll them up a bit with some lace, jute chord or even wrap them. Organize your odds and ends like spatulas, makeup brushes, and napkins! Chances are you received some delicious candy in a cute little tin box for Christmas. Instead of chucking it once the goods are gone, use it to get organized! You can store colored pencils, notepads, literal scrap booking scraps, or my personal favorite, your smaller Christmas decorations. If the tin is a little too Christmassy to leave out in plain sight all year, most of them can fit very easily into a drawer or cabinet. Bring them into view next Holiday Season to add some extra Cheer! If you have a baby or know someone who does, those little baby food jars can turn into a great organizing tool! You can upcycle them as spice containers. Do a paint job on the lids, place a cute label on them, or even magnetize the lids to organize your spices on your fridge, or a piece of sheet metal inside your cupboard. Does everyone have a pile of empty plastic bags laying around, or is it just me? Emptied out tissue boxes can be turned into super awesome plastic bag dispensers. Wrap or paint the box with your own custom detailing you savvy saver, you! The modern woman has an annoying amount of cords and wires to keep track of. If you’re like me, they end up getting wadded up and thrown into a junk drawer, which leads to a tangled disaster. Use the cardboard from your toilet paper rolls as a cord organizer. You can use these little suckers to label those cords plugged into your power strip. They happen to fit nicely around your stereo, computer and lamp cords. Use a sharpee or a little paper and tape to finish off your handy little label. Plastic Folgers bins come in multiple sizes, and once the coffee’s gone you can use them to store dry goods like rice and flour, or cooking utensils and art supplies. Paint them up and embellish them with free labels. Since they have that nifty little handle indention, you can easily grab them up and move them about one handed. Awesome advantage for people with tiny hands, like me! You can upcycle cereal boxes into handy file holders. Cover them up with some cute card stock or even some left over wrapping paper. Hang them with magnet clips on your fridge to hold menus, quick recipes or coupons. Make sure you donate the Box Tops for Education though! Alright you DIY Darlings, do have any other awesome organization tricks? Share them with us in the comment section! Tags: cans, DIY, free, fresh, home, house, jars, life, living, money, new, new year, organization, organize, organized, organizing, recycle, repurpose, upcycle. Bookmark the permalink. to a few buddies ans also sharing in delicious. And obviously, thanks on your sweat!